Apogee Electronics announces that the Symphony 64 is now shipping worldwide to authorized dealers and distributors. 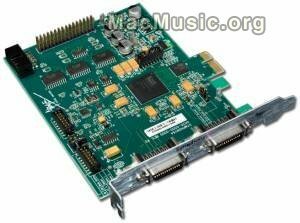 Symphony 64 is a 64 channel, 24bit/192kHz PCI Express card made to interface Apogee's X-Series and Rosetta Series converters directly to Apple's Mac Pro creating The Symphony System. - Apogee's VBus - virtual routing within a Core Audio application or between multiple applications. The Synphony 64 is priced at $995. However, Apogee is offering an upgrade program to customers who have purchased a Symphony PCI-e card between the dates of August 1, 2008 and December 31, 2008. All that qualify for the program can upgrade to Symphony 64 directly thru Apogee for $295.